Time to clear out your diary and make room for checking out Public, the new SE18 foodie institution opening today. Located in the old Woolwich Public Market, the newly refurbished venue will be home to eight food vendors as well as several bars. The brains behind the venture is Street Feast, who also runs Dinerama in Shoreditch, Hawker House in Canada Water, Giant Robot in Canary Wharf and Model Market in Lewisham. 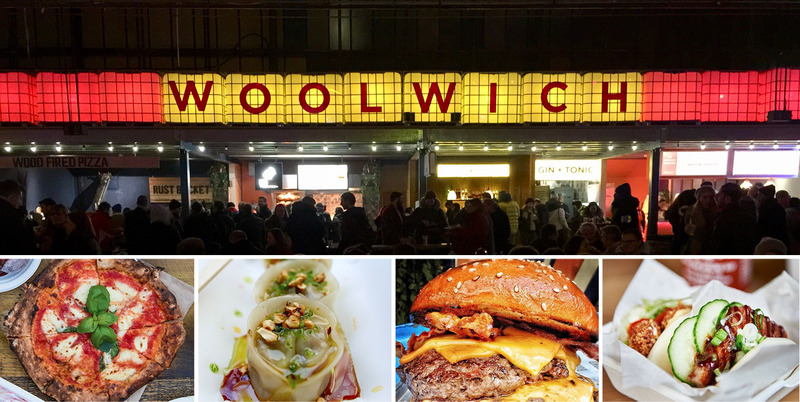 Not only does Public give a new lease of life to a historic venue that’s been sitting empty since early 2017, it is also a welcome addition to the Woolwich weekend nightlife – which at best could be described as ‘lacking’. On Fridays the venue is open from 5pm and Saturdays from noon till late, making a daytime visit also a family friendly option (there’s a trampoline for kids!). Purveyors of gourmet burgers including The B.B.B. (a signature 90 Day Aged Patty, Double American Cheese, Crispy Bacon, Burnt Butter Mayo & Onion). Henhaus, as the name suggests, focuses on the delights of rotisserie chicken coupled with hand-cut fries and ‘lashings of meaty gravy’. Salty, crispy squid is the ticket with Ink, served with homemade mayo and trimmings. No feast would be complete without a dessert. Cue in the Lava Bar, which will be serving a decadent selection of doughnuts including Double Choc (Chocolate doughnut filled with molten chocolate cookie dough, double chocolate sauce and cereal milk ice cream). Wood-fired pizza of the heavenly kind. An old Woolwich favourite now located at Public, Rust Bucket serves authentic Neapolitan pizzas to die for. Salt Shed specializes in all things delicious and meaty including Salt Beef Short Rib (BBQ beef rib, honey mustard glaze, chilli churri). Yum in a bun, basically. Taiwanese steamed buns with either veggie or meat fillings such as Pork Bun (Slowly roasted belly pork, cucumbers, spring onions, hoi sin sauce). From the Yum Bun team, gorgeous vegetarian and meaty dumplings including Steamed Mushroom Dumplings with Roasted Cashews. GIN KITCHEN (a selection of gin), STREET VIN (a selection of wine), RUMHOLE (a selection of – you guessed it – rum), UNION complete with pool tables as well as the MARKET BAR serving beers and cocktails.